After three good weeks, markets reversed course and closed significantly lower this week. Expectations of a Santa rally are looking less likely and skepticism seems to be the order of the day. This week the Fed cut rates and announced a lending facility to inject liquidity into the credit market. Investors were less than impressed. Inflation reared its head in the PPI numbers as price increases were larger than expected. In spite of good news on retail sales and jobs, all the major averages finished the week down over 2% with the Russell 2000 down a whopping 4%. For a while now, Treasury bond prices have been going up every time stocks have gone down. This week we saw a turnaround in the bond market, with the smell of inflation causing bonds to sell off in lock-step with stocks. Seems like there was no place for an investor to hide this week. In trying to gauge the market direction, it is hard to ignore the fact that the S&P 500 closed down 2.4% this week and, in another bearish indication, is below its 200-day simple Moving Average again. Looking at the SPDR S&P 500 (SPY), you will see that the ETF's 20-day exponential moving average approached but failed to cross above the 50-day EMA as the ETF tumbled along with its underlying index. In the chart below, the simple moving averages are nowhere close, with the 20-day still well below the 50-day. MACD has not quite rolled over yet but is getting close. Relative strength is clearly weakening. 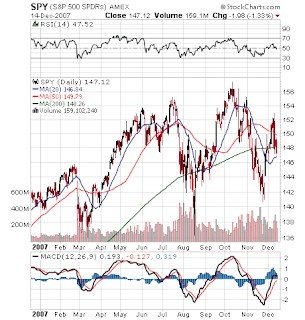 Looking at the TradeRadar signals, SPY is in full SELL mode when looking at the daily chart starting from March 2007. The recent rally attempt, measured from the high in early October to the low in late November to now, is still generating a weak BUY signal but it is in danger of getting weaker and reversing. In the near term, the charts overall look more like we are going to see another leg down. Two of our recent bearish picks, SKF and SRS, hit stops and were sold a week and a half ago. This week they have both recovered nicely. I am seriously thinking of jumping into SKF again as the ETF looks like it is on the rise and financials are dragging the markets down again. Let's look a little closer at one of our other bearish picks, ProShares UltraShort FTSE/Xinhua China 25 Index ETF (FXP). This double short ETF rises when the FTSE/Xinhua China 25 Index ETF (FXI) goes down. We'll examine the chart of FXI to see what might developing. As can be seen in the chart above, 20-day simple moving average remains stubbornly the the 50-day MA. MACD has already turned bearish and relative is weak. The ETF is trading below both these shorter term MA's but after such a strong showing earlier in the year it remains well above its 200-day MA. The TradeRadar signal is still SELL on the daily chart and the recent rebound has not qualified as a short-term BUY signal. The weekly chart tells the same grim story. So the charts look gloomy but what about the fundamentals? It appears that the rate of growth in China is slowing somewhat. Note that I said the "rate" of growth. With inflation and energy costs increasing, U.S. demand potentially moderating, the Chinese government trying to put the brakes on lending, international pressure to let the yuan appreciate, it is clear that the Chinese economy is facing some headwinds. Nevertheless, China is in no way in danger of recession; there are still too many positives at work. Growth will continue; it just may not be as strong as we have seen over the last couple of years. Still, with financial and credit problems playing out in some of the developed countries that play such an important role in creating demand for Chinese manufactured goods, there is the danger that a slowdown in the West could indeed impact China. So the question is: given the economic backdrop, are current stock prices justified? 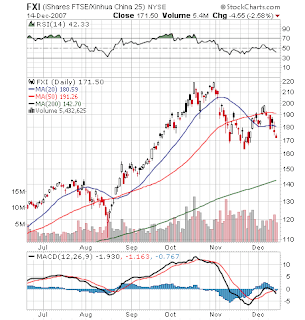 With FXI up 47% so far this year, even with the recent downturn, should we expect more appreciation in this ETF? Or should we expect FXI to seek a level commensurate with the current risk and the remaining underlying strength in the Chinese economy? What might that level be? FXI has fallen 21% from its peak at the end of October. It is my feeling that FXI has further to fall; maybe not a lot but enough to justify holding a position in the ultrashort FXP for a while longer.